Acute or chronic back and neck pain is a major social, economic and healthcare issue in all communities. Nearly 80% of the population experiences backache during their lifetime. Percutaneous laser disc decompression (PLDD) is one of the minimally invasive methods for treating low back pain. There have been numerous reports of its use since the first case in 1986, and the indications are expanding daily. 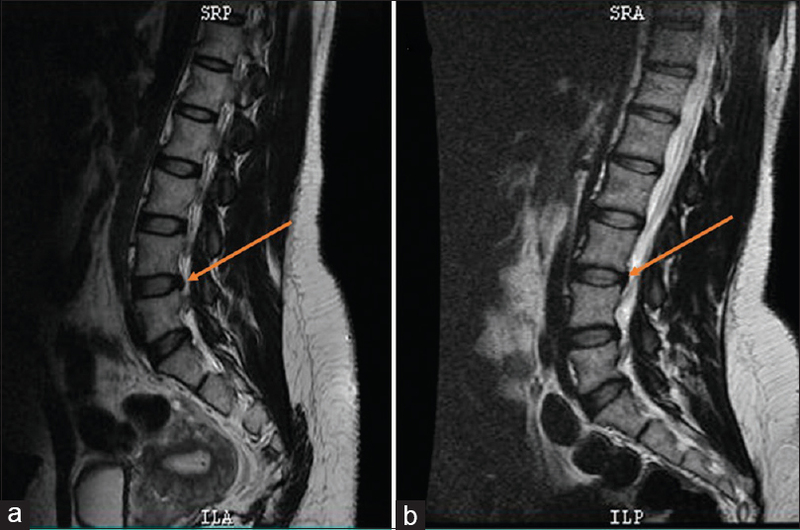 We present a case of a 38-year-old banker with chronic prolapsed intervertebral disc who had 7-year history of recurrent low back pain from prolapsed L4–L5 intervertebral disc with radiculopathy. She had PLDD procedure in our clinic under local anaesthesia as day case. After the procedure, the patient was observed for 4 h and discharged home. She felt significant pain relief after the operation and was placed on a lumbar corset for a week. 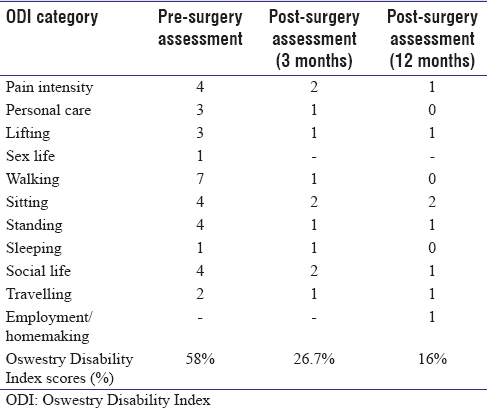 The pre-surgery assessment using Oswestry Low Back Pain Disability Index was 58% (severe disability) but was reduced to 26.7% (moderate disability) after 3-month post-surgery follow-up. At 12-month follow-up, the Oswestry score was 16% and the patient outcome was good according to MacNab's criteria. PLDD is safe and effective for the treatment of low back pain seen in the post-operative result of this presented case. Acute or chronic back and neck pain is a major social, economic and healthcare issue in all communities. About 80% of adults experience low back pain at some point in their lifetimes. It is the most common cause of job-related disability and a leading contributor to missed work days. Mixter and Barr first described that herniation of lumbar disc is a cause of lower backache which is now increasing in the younger population due to misdirected spinal kinetics secondary to improper posture, heavy-load lifting and motorbike driving. Disc prolapse accounts for 5% of low back disorders yet is one of the most common reasons for surgery which includes open laminotomy, discectomy, microdiscectomy and endoscopic discectomy. Majority of the patients respond to conservative treatment options and may not require operative intervention. Percutaneous laser disc decompression (PLDD) is one of the so-called 'minimally invasive' treatment modalities for contained lumbar disc herniation. The idea of using laser in the treatment of lumbar disc herniation arose in the early 1980s when Choy performed the first PLDD on a human patient in February 1986 after a series of in vitro experiments., The US Food and Drug Administration approved PLDD in 1991 after which thousands of lumbar disc herniation cases have being treated using laser worldwide. This case report presents the results of disc protrusion treatment in a 38-year-old female with the use of PLDD. The detailed rationale of the method, surgical procedures, outcomes and follow-up is explained. In January 2017, a 38-year-old female patient was referred to us by a physiotherapist who has being treating this patient with medication and acupuncture for 6 months with no improvement. She presented to us with complaints of low back pain. Pain radiated to both lower limbs down to the foot but worse on the left limb with evidence of paraesthesias. The degree of the pain was of a scale of 7–8/10 which makes daily activities challenging for the patient. She was unable to sit for >10–15 min. The history of her back pain dated for 7 years after her last delivery. Since then, the pain has being recurrent till she was referred to us. She had no evidence of sphincteric dysfunction. On examination, she was anxious and in pain. There was tenderness over her lower lumbar spine with hypoaesthesia around L5 dermatome. Straight leg raising test was 0-60 and 0-70 degrees on the left and right lower limbs respectively. Sciatic stretch test was positive on the left. Power of ankle dorsiflexors was 4/5. The X-ray taken on diagnosis showed loss of lordosis. Magnetic resonance imaging (MRI) was also taken which revealed prolapsed disc at L4/L5 intervertebral disc space. She was counselled on two different surgical procedures – PLDD and open surgical decompression along with their risks and benefits. Having educated her on the procedures, her consent was gotten for PLDD and the procedure was performed. The patient was placed on the table in prone position for the procedure. After cleaning and draping, local anaesthetic (1% lidocaine) was infiltrated about 10 cm from the midline on the affected side (L4–L5 intervertebral disc space). Then, under X-ray image intensifier control, an 18G × 88 mm needle was inserted into the disc posterolaterally at an angle of 45° to the midline [Figure 1]. The needle was positioned midway between the two endplates and inserted until the tip was 1 cm posterior to the centre. To avoid injury to the endplate due to heat, the needle is positioned parallel as it approaches the nucleus [Figure 2]. This was followed by insertion of 400 μm optical fibre through the needle. 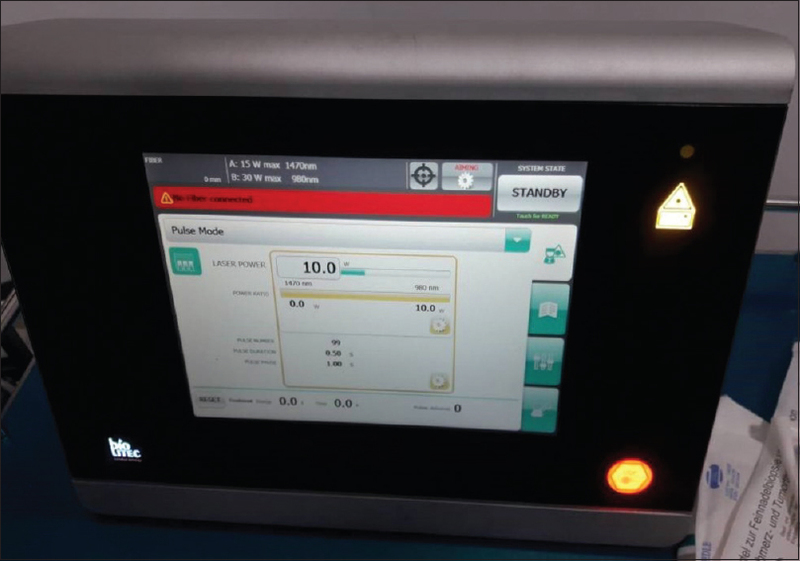 To avoid blockage to the passage of vapour through the needle which may result in pain the tip of the optical fibre is inserted 1 cm beyond the needle tip. About 800 J of energy was delivered with a 970-nm LEONARDO diode laser (biolitec) surgical laser initiated at 10 W for 0.5-s pulse on 1-s off duration to allow heat dissipation and avoid or minimise the pain caused by the heat [Figure 3]. The pre-operative MRI showed that L4/5 lumbar intervertebral disc was bulging and compressing the nerve as seen in [Figure 4]a. After the PLDD procedure, she felt a significant pain relief and was observed for 5 h before discharge home. She was placed on a lumbar corset for a week and bed rest for 72 h. At 12-month follow-up, patient outcome is good according to MacNab's criteria and a complete resolution of neurological signs. The post-operative image taken after a year showed a significant reduction of the herniated disc as seen in [Figure 4]b. Using Oswestry Low Back Pain Disability scores, the pre- and post-assessment index after 3-month post-operative follow-up showed 31.33% reduction of the Oswestry Disability Index (ODI) score from 58% which is a severe disability category (41%–60%) to 26.7% which falls under the moderate disability category (21%–40%). At 12-month follow-up, a significant reduction in pain disability index from 26.7% (moderate disability category 21%–40%) after 3 months to 16% (minimal disability 0%–20%) was observed. This significant change is clinically relevant. The patient reported feeling much better after 12-month follow-up [Table 1]. The principle of percutaneous lumbar laser disc decompression is based on the concept of the intervertebral disc being a closed hydraulic system. This system consists of the nucleus pulposus, containing a large amount of water, surrounded by the inelastic annulus fibrosus. An increase in water content of the nucleus pulposus leads to a disproportionate increase of intradiscal pressure. In vitro experiments have shown that an increase of intradiscal volume of only 1.0 mL causes the intradiscal pressure to rise by as much 312 kPa or 2340 mmHg. On the other hand, a decrease in intradiscal volume can cause a disproportionately large decrease in intradiscal pressure. A reduction of intradiscal pressure causes the herniated disc material to recede toward the centre of the disc, thus leading to reduction of nerve root compression and relief of radicular pain., As shown in [Figure 4], the procedure created a significant reduction of the herniated disc which in turn led to relief of nerve compression. Scott also reported similar result after PLDD procedure on ten patients with significant pain reduction which was not accomplished with conservative treatment. Other authors reported success treating lumbar discogenic pain with PLDD which is in accordance with our result., [Table 1] revealed how life activities have been difficult for the patient due to discogenic pain with ODI score of 58% before surgery. The post-surgery assessment of the patient was 26.7% at 3 months and 16% at 12 months which is a significant improvement. Comparing the pre- and post-ODI category, there was a significant reduction in the ODI score of 42% which is a clinically relevant change from severe disability category (41%–60%) to minimal disability category (0%–20%). The reason for this great reduction must have been as a result of the disc being decompressed relieving the nerve from compression by the bulging disc which must have reduced the production of several inflammatory mediators such as cyclooxygenase-2, prostaglandin E2, necrosis factor-alpha, nitric oxide, interleukin (IL)-1 alpha, IL-1 beta, IL-6, IL-8 and the macrophage infiltration into protruded disc material which can trigger cytokine production and continuation of neurological symptoms., This report is in accordance with the finding of other workers.,, More studies with larger volumes will be needed to further elucidate the outcomes. This report demonstrates that PLDD is a safe and effective method of treating patients with back pain resulting from herniated lumbar disc. 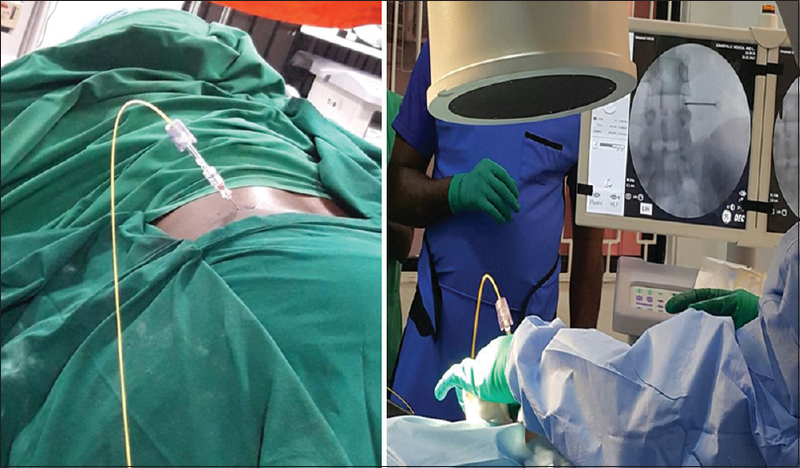 The advantages of PLDD as seen in this case include less hospitalisation, no general anaesthesia, minimal recovery time with no scar, less post-surgical complications and quicker return to normal daily activities. It also burns no bridges as open surgical procedures can be done subsequently if needed; indeed, it can be said to be a bridge between conservative treatment and surgical treatments. Ali YM, Sarwar JM, Hossain MS, Sarker MC, Kayes MN, Rahman MM. 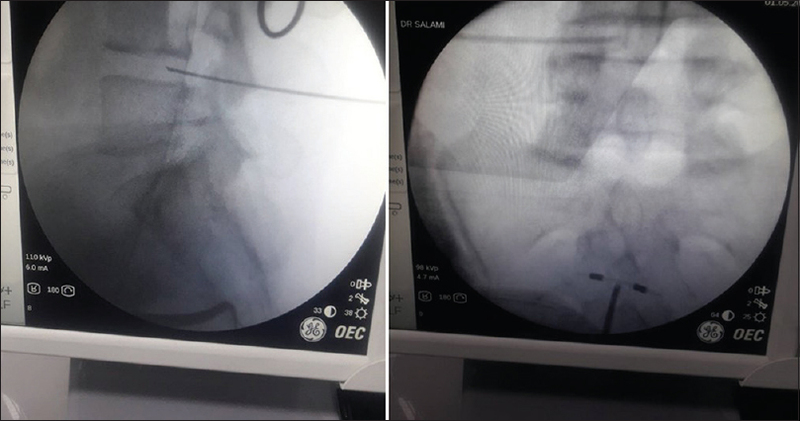 Percutaneous laser disc decompression: A minimally invasive procedure for the treatment of intervertebral disc prolapse – Bangladesh perspective. Photon Lasers Med 2013;2:249-54. Mixter WJ, Barr JS. Rupture of the intervertebral disc with involvement of the spinal canal. N Engl J Med 1934;211:210-4. Sato M, Ishihara M, Kikuchi M, Mochida J. The influence of Ho:YAG laser irradiation on intervertebral disc cells. Lasers Surg Med 2011;43:921-6. Choy DS. Percutaneous laser disc decompression (PLDD): Twelve years' experience with 752 procedures in 518 patients. J Clin Laser Med Surg 1998;16:325-31. Choy DS. Introduction: Percutaneous laser disc decompression. In: Choy DS, editor. Laser Disc Decompression – A Practical Guide. New York: Springer; 2003. p. 3-18. Goupille P, Mulleman D, Mammou S, Griffoul I, Valat JP. Percutaneous laser disc decompression for the treatment of lumbar disc herniation: A review. Semin Arthritis Rheum 2007;37:20-30. Choy DS, Michelsen J, Getrajdman G, Diwan S. Percutaneous laser disc decompression: An update – Spring 1992. J Clin Laser Med Surg 1992;10:177-84. Choy DS, Altman P. Fall of intradiscal pressure with laser ablation. J Clin Laser Med Surg 1995;13:149-51. Schenk B, Brouwer PA, van Buchem MA. Experimental basis of percutaneous laser disc decompression (PLDD): A review of literature. Lasers Med Sci 2006;21:245-9. Choi JY, Tanenbaum BS, Milner TE, Dao XV, Nelson JS, Sobol EN, et al. Theramal, mechanical, optical, and morphologic changes in bovine nucleus pulposus induced by nd:YAG (lambda = 1.32 microm) laser irradiation. Lasers Surg Med 2001;28:248-54. Castro WH, Halm H, Jerosch J, Schilgen M, Winkelmann W. Changes in the lumbar intervertebral disk following use of the holmium-Yag laser – A biomechanical study. Z Orthop Ihre Grenzgeb 1993;131:610-4. Duarte R, Costa JC. Percutaneous laser disc decompression for lumbar discogenic radicular pain. Radiologia 2012;54:336-41. Haufe SM, Mork AR, Pyne M, Baker RA. Percutaneous laser disc decompression for thoracic disc disease: Report of 10 cases. Int J Med Sci 2010;7:155-9. Casper GD, Hartman VL, Mullins LL. Results of a clinical trial of the holmium:YAG laser in disc decompression utilizing a side-firing fiber: A two-year follow-up. Lasers Surg Med 1996;19:90-6. Gevargez A, Groenemeyer DW, Czerwinski F. CT-guided percutaneous laser disc decompression with ceralas D, a diode laser with 980-nm wavelength and 200-microm fiber optics. Eur Radiol 2000;10:1239-41. Knight M, Goswami A. Lumbar percutaneous KTP532 wavelength laser disc decompression and disc ablation in the management of discogenic pain. J Clin Laser Med Surg 2002;20:9-13. Anzai H, Hamba M, Onda A. Epidural application of disc-related cytokines on spinal nerve roots; a morphological and neurophysiological study. Eur Spine J 1996;5:187-92. Hayashi S, Taira A, Inoue G, Koshi T, Ito T, Yamashita M, et al. TNF-alpha in nucleus pulposus induces sensory nerve growth: A study of the mechanism of discogenic low back pain using TNF-alpha-deficient mice. Spine (Phila Pa 1976) 2008;33:1542-6. Singh V, Benyamin RM, Datta S, Falco FJ, Helm S 2nd, Manchikanti L. Systematic review of percutaneous lumbar mechanical disc decompression utilizing dekompressor. Pain Physician 2009;12:589-99. Grönemeyer DH, Buschkamp H, Braun M, Schirp S, Weinsheimer PA, Gevargez A. Image-guided percutaneous laser disk decompression for herniated lumbar disks: A 4-year follow-up in 200 patients. J Clin Laser Med Surg 2003;21:131-8.